The Society’s annual Design Competition, with total prize money of over £14,500, is unique in its breadth of coverage and attracts almost 1,000 entries from students throughout the UK. The Bradford Textile Society derives the greatest pleasure from the continuing success of its Prize Schemes, which have been the source of encouragement and inspiration to textile students and practicing textile designers, and have helped to stimulate new developments in textile design and construction, and finishing and printing techniques. Many members are convinced that this competition, one of the oldest of its kind, is the most important event in the annual programme. 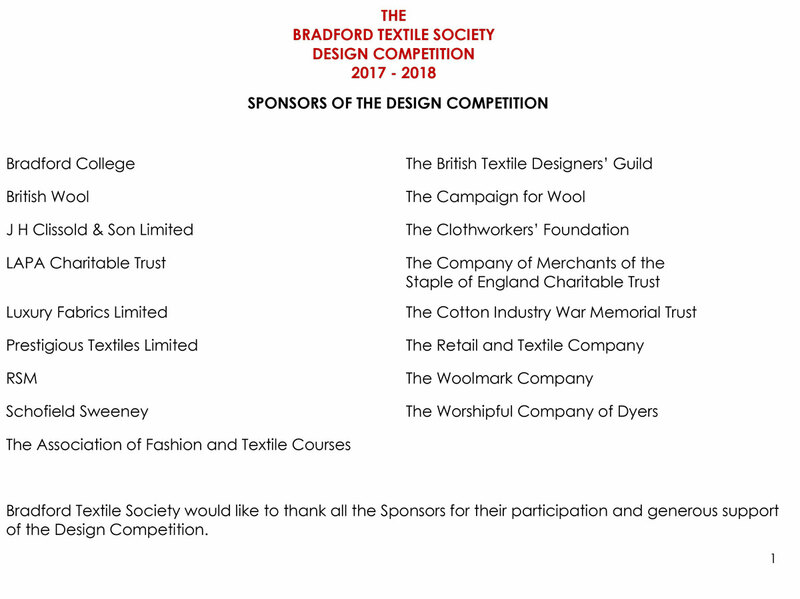 The original sponsors, the Society itself and the Wool Record, share the distinction of having presented special prizes for design achievement since the Schemes were established in 1923. The Society is also grateful to individual organisations and companies, whose support and encouragement has helped the organising committee to increase the total prize money by a considerable amount over the years. In particular it acknowledges the generosity of the Cloth-workers Foundation, which has awarded a number of prizes since 1968, the Dyers’ Company, Prestigious Textiles Ltd, The Wool-mark Company, the British Wool Marketing Board, the Association of Fashion & Textile Courses, Holland & Sherry Ltd and Bradford College. Student information for design seminar and booking form also included in the link below. Entries to this year’s Design Competition need to be returned to their rightful owners. If you are attending the Design Seminar and Award Ceremony on the 10th May at the Dye House Gallery you may collect your work from there after the Award Ceremony but please inform the Secretary before the 30th April if you wish to do so as arrangements need to be made to take the work to the Gallery. Alternatively, work can be returned by post or courier on the dates below. This needs to be arranged by tutors or students and the secretary must be notified in advance. The work is parcelled by university/college and must be returned as a group, it is impossible to return individual pieces separately. We only borrow the office at Church Bank House and it is not manned continuously. It will help us greatly if you would please arrange couriers for these days only and notify us in advance so that any labels can be printed and work is ready to be collected by the couriers. We aim to return all work as soon as possible to its rightful owner as it may be needed for assessment purposes or portfolios. Please help us to do this by following the above instructions. Any work remaining on the 30th June will be deemed unwanted and disposed of. The prospectus for 2019 – 2020 will be launched in early September.